Business Scenario: Suppose in an Organization for some Maintenance activity they need a Grinder Machine . It might be the case that the Machine is already there and they can reserve the machine for some day(why reservation of the machine like in a big org they can have multiple maintenance activities and some of them may need the same machine) but what if the Machine is not there. That time the Org takes the decision to get it from Vendors for which the Purchasing dept should raise a Purchase requisition ,then Purchase order and at last the vendor supplies the goods. In SAP R/3 the issue can be replicated by Creating a Reservation(Tx-MB21) which says that there is a requirement for some material and then they go to Tx-ME51N and Create the Purchase Requisition and then Pur Order . 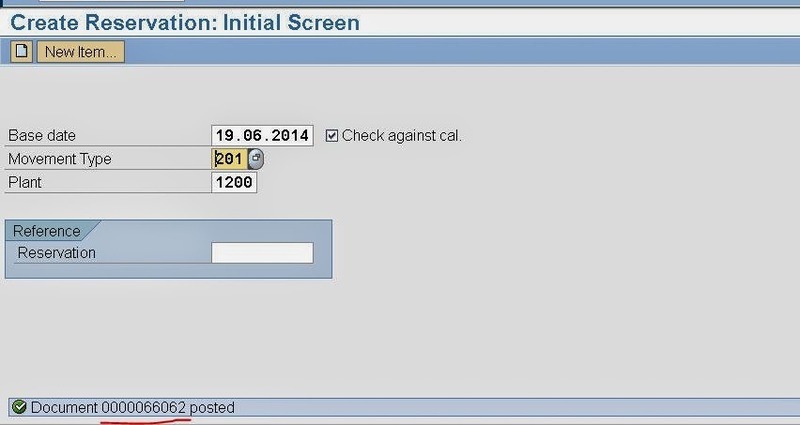 This all needs front end interaction with the SAP GUI. Here the Org can take the Decision that when ever there is any requirement for a Material the Purchase Requisition should generate automatically and also the Purchase Order by some background job. In such case we can use the Standard BAPI: ‘BAPI_PR_CREATE’ to generate the Purchase Requisition from the Reservation . Step1. Go to Tx- MB21 to create a reservation of material. Step2. Provide the details and click on Create Button. Step3. Provide the cost center and Material number, quantity, plant and storage location. It signifies that this plant needs material for the Maintenance activity. Step5. Teh Reservation Number is generated. Step6. The Reservations are stored in the Table: RESB. Step7. Then the User Run the Tx: ME51N to cretae a purchase requisition for the required material quantity . Step8. Pur Req- Doc type is NB. Provides the material number and quantity and creates a purchase requisition. Step9. The below Pur Requisition is generated which can be displayed in ME53N. Step10. Lets Automate the process by Using BAPI fm. The Bapi: BAPI_PR_CRETAE can be used to create the bapi in background. Step11. Create a message class to show our message. Step12. Below report creates the Purchase requisition for the selected Reservation. DATA : lt_resb TYPE TABLE OF resb. SORT lt_resb BY rsnum rspos. FORM fm_status USING rt_extab TYPE slis_t_extab. IF rs_selfield-sel_tab_field = ‘1-RSNUM’. ” CHeck if the User Single-click on the Reservation No. LOOP AT it_resb INTO ls_resb . pos = 10 + ls_resb-rspos – 1. WHEN ‘CRT_PR’. ” Fcode when the user clicks on the Appl Tool Bar Button “Create Pur Req” . READ TABLE t_ret INTO s_ret WITH KEY type = ‘S’. MESSAGE I000 WITH s_ret-message_v1 rs_selfield-value. Step13. Create the PF status with below application tool bar Button. Step14. Run the report and we can see all the Reservations created for the current date. Step15. Select any one and click on the Button Create Pur Requisition. Step16. The BAPI is executed and the Pur Req. is generated which can be viewed in Tx- ME53N.